Barna Recycling is committed to providing the highest standards in the provision of waste management services to their customers. We have a commitment to providing a service that seeks to incentivise waste prevention and to encourage the segregation of waste so that it can be managed in accordance with the waste hierarchy, whereby waste prevention, preparing for reuse, recycling, and other recovery are preferred over the disposal of waste. This approach is in line with current national waste policy in the area — A Resource Opportunity — Waste Management Policy in Ireland. This document is designed to communicate how we intend to provide household waste collection services in accordance with these principles to the public in a clear and concise fashion. b) All service provision will be carried out in line with current local and national legislation and in line with sustainable waste management practices. Our National Waste Collection Permit Office (NWCPO) waste collection permit number is NWCPO-08-03604 and the details of the permit can be viewed at www.nwcpo.ie. e) We will explain clearly what your service rules are and the reasons for them. h) We will design our service and carry out collections in a way that minimises litter and odour nuisance. • Residual Waste Bin—in line with the European Union (Household Food Waste and Bio-waste) Regulations 2015. • Recyclable Waste Bin — at least every fortnight. • Food & Bio Waste Bin —in line with the European Union (Household Food Waste and Bio-waste) Regulations 2015.
c) We will inform all customers availing of a domestic waste collection service at least 10 days in advance of any predictable alternative arrangements made for collection in relation to public holidays etc., or any proposal to vary the level of collection. e) At the time of initial service provision, each customer will be provided with details of their service providers; full name and address, contact details (website where available, phone number, email, postal address), a clear breakdown of pricing policy for provision of service, process for accessing account statement and balances, procedure for receipt of payments, process for dispute resolution, procedure for customers who have fallen into arrears with their payments, where applicable, service provision frequency and details and the procedure for cancellation of service provision, including refund of charges where applicable. You will also be provided with details of the period of validity for the offer provided and advised of a cooling off period, should you wish to change your mind (usually any time prior to delivery of bins but at least 7 days from time of contract signing). f) In the case of e-Commerce contracts with customers, and in line with reducing paper usage, all communication and documents will be available through the customer’s online account, unless otherwise requested. In the interests of the environment and reducing costs we are committed to increasing communication by this method. a) In line with national policy, prevent, reuse and recycle waste as much as possible. Refer to national and regional campaigns that seek to help reduce waste production. 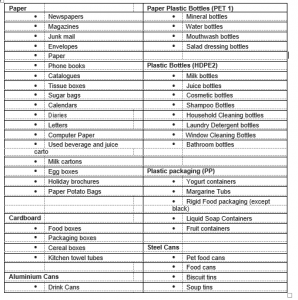 Present your waste materials, properly segregated and placed in their respective bins / receptacles. Please refer to our Waste Segregation and Presentation Guidelines (see section 7 below) which are available on our web site or which are available to send to you by post, if requested. b) Segregate your waste appropriately. Please note the procedure in place should the incorrect waste be placed in a bin (e.g. food waste placed in the recycle bin): (Procedure for dealing with contamination of a bin through waste being deposited in the incorrect bin to be inserted by collector) The Company will apply an extra charge of €30 per bin, per incident, if a bin designed for recyclable material is contaminated with non-recyclable material e.g. landfill waste. with how we will manage customers who have difficulty paying their bill. We reserve the right to withdraw service provision either permanently or temporarily due to the non-payment of outstanding bills. d) Contact us, as your waste management service supplier, if you have any queries on how best to manage any of your waste materials. We have the expertise to provide the appropriate service or advice on how to best resolve the issue. c) Information, including a copy of Terms and Conditions of Business will be provided to Customers as part of new Customer Welcome Packs and will be available on the company’s website and/or www.nwcpo.ie. f) National policy has moved towards a position where all customers will be billed according to the weight of the waste that they produce (pay-by-weight). This is in line with the EU Polluter Pays Principle. IWMA members are committed to adopting this methodology and it will be phased in over time n l ne with the national timelines. You will be notified in advance of the changes involved and he benefits. b) We will respond to formal complaints that we receive about our services in a timely and professional manner. In the case of written complaints, within 10 working days. e) Dispute resolution including withdrawal of service will be in line with the company policy available on the company website or which is sent out by post on request. This will be a fair and equitable process in line with good consumer policies. a) We shall implement an education and awareness programme in relation to waste management for householders that we service. This will be available via promotional literature that we provide directly to you and via our website or through the website of the National Waste Collection Permit Office. d) We will provide Waste Segregation and Presentation Guidelines to customers, or at a minimum to the National Waste Collection Permit Office for publishing on their website, which clearly explain which materials are to be placed in which bin and collect at a minimum the recycling materials set out below and as prescribed in the sixth schedule of the Waste Collection Permit Regulations. We will explain to you what happens to materials collected in the residual, recycle and food waste bins. (a) Should you wish to terminate your service provision, please advise us by email or in writing or by phoning giving 30 days’ notice. The Company will only accept notification regarding change or cancellation of the Customer contract from the account holder and not from any unauthorised third parties. (c) If there is a credit balance owing on your account, after a Cancellation Charge (if applicable) is deducted, will be refunded to you within 30 days of receipt of termination notice. (d) We will ensure that there are no direct impediments to you switching your service provider, but cancellations will not be accepted from any unauthorised third party. 1. When switching providers, you may be asked to provide proof that all outstanding bills have been paid to the previous provider. If requested we can provide a receipt and confirmation for your next service provider that your account is paid in full. This will be issued within 7 days of receipt of any final payment made or received. A new provider is entitled to request this document and if applicable will be in their Terms and Conditions of Business. Charges are clearly described in Terms and Conditions f Business available on our web site and which we can dispatch by post if requested. The cancellation charge covers costs of recollection, cleaning and servicing of bins. (a) At time of initial service provision, by agreement, each customer will be supplied with the appropriate bins / receptacles sized service their specific needs. The bins provided for service collection remain the property of the service provider. (b) In the case of changing equipment / ceasing service / changing service provider, we commit to the collection of your old bins by arrangement via our call centre within 30 days of the notification of ceasing of the service. of the notification of ceasing of the service. We require that your old bins are left empty and easily accessible for collection. (c) This Charter does not affect your statutory rights in any way and provides a simple interpretation of our commitment to you, our customer, and what we expect in return, to help ensure that you are provided with the best service level possible.